Let me just admit it-I LOVE DISHES!! It shows in my collection. Some I purchased to keep, others I purchased to re-sell to raise funds for the house museum. All at some point in time are used (that’s what they are for) and I truly enjoy creating beautiful table settings either for my guests or just for fun. Yes, I set the table for fun! One of my favorite glass colors is Jadeite green, a sweet minty-green popular from the time it was created in the early 1930s. While it waned in popularity after the 1960s (everything does), it enjoyed a strong come-back when domestic doyenne Martha Stewart used pieces in one of her studio kitchens. She even had new pieces manufactured for her merchandise line and set a gorgeous Thanksgiving table using some Jadeite pieces. Two patterns are dominant in my collection in the pretty color, Alice and Jane Ray. Jane Ray came in more pieces than Alice, but the two patterns can be used together. They both have rays in the pattern and manufactured by the same company, Anchor-Hocking, which is still in business today, American owned and made. 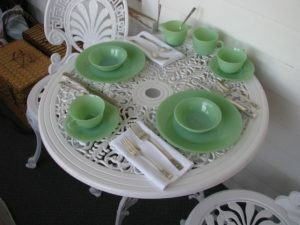 I created a quaint table setting for two, using my white iron bistro set on the front porch. Jadeite evokes spring and freshness to me, and I absolutely love to pair Jadeite with white-so crisp and clean! My great-grandma’s silver plated flatware, Coronation by Oneida, goes perfectly with the Jane Ray pattern. Crisp, white cotton napkins finish off the table. Jane Ray was manufactured by Anchor Hocking from 1945 until some time in the 1960s. It also came in milk white and vitrock, a shade of ivory. It’s a small pattern, consisting of only 14 pieces. I also have the oval tray, but the table was too small to accommodate it, and a cover for the sugar, which I have yet to find! It’s somewhere, though, and I’ll find it one of these days! Jadeite Jane Ray on a sunny Spring day!